Contact us for your very best price based on the actual number of guests and length of your stay. We offer great rates for stays of 5 nights or more and for two or four guests staying 7 or more nights in low season. Search for "Pine View Home of Leadville." 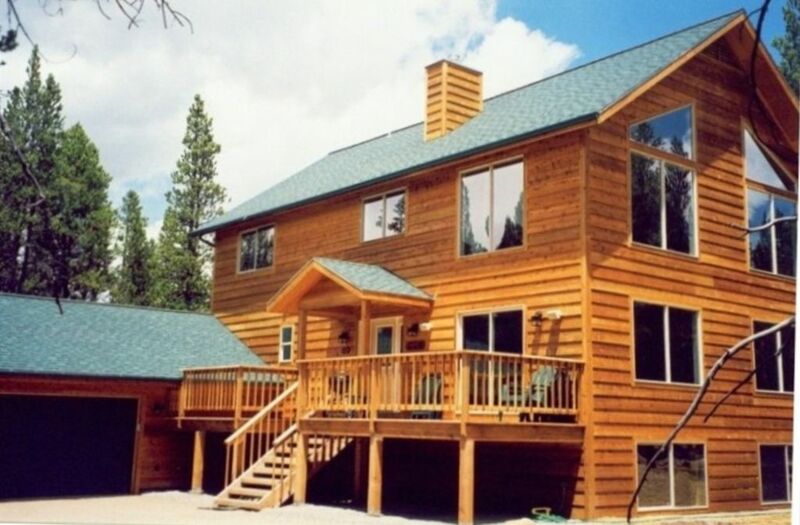 Our recently constructed vacation home is ideal for family gatherings to enjoy the wide variety of mountain sports in the historic Leadville area. It's a spectacular home in the nicest subdivision in the area on a very private 5 acre lot and just 5 minutes to the grocery store on paved roads. The master bedroom includes a balcony overlooking the living room, vaulted ceilings, bathroom with two sinks, and large tub/shower with dual shower heads. There's a second master suite with attached bathroom plus another bath and bedroom and a game room with pool table in the lower level (making 6 sleeping rooms plus 5 baths). Everything is included, cable TV, flat screen TVs in every bedroom, DVD/CD players, 55 inch and 42 inch HDTVs in living and game rooms, high-end surround sound system, computer w/printer and unlimited 45 Mb/sec high speed internet, both wired & wireless internet connections in bedrooms, second computer in finished laundry room, spectacular 5 foot tall all glass free-standing fireplace, very private deck, 3 car attached garage with five bikes for guests. Summer activities such as rafting and horse riding are 20-45 minutes to the South, hiking and biking is everywhere, including the 160 acre common area that's part of the subdivision (you can fish in the Arkansas river that flows through the subdivision common area), golf is four minutes away, a night out at a fine restaurant in Vail is 40 minutes North, local restaurants are fun as well. Or, simply enjoy an evening around the outdoor fire pit. Winter activities such as downhill skiing are only a short drive: 10 minutes to Ski Cooper, 25 minutes to Copper Mountain, and 45 minutes to Vail/Beaver Creek, Breckenridge, Keystone/A-Basin, Loveland, and 80 minutes to Monarch. Contact us for your very best price based on the actual number of guests and length of your stay. We offer great rates for two or four guests staying 7 or more nights in low season. This property is licensed through Lake County Land Use, License #2019-63. Keywords: House, condo, vacation home, cabin. We're a hard working family of four living in Waukesha, Wisconsin. We built the home in 2005 with the help of an excellent construction team in Leadville plus Sue's father, a retired paper mill worker from Wisconsin. We love getting to Leadville, Colorado and our vacation home as much as possible. If we're not in Colorado, we enjoy traveling with our twin sons. They're in college now and Leadville is a great place for Spring break. The picture is from our favorite restaurant in Paris. Colorado has long been a destination spot for our family. The Leadville area is central to so many activities, either Winter or Summer. Not to mention, the price is right compared to near-by 'big name' resort areas. Being a hard working, cost conscientious family, we appreciate good value combined with quality, and Leadville offers that. We enjoy our quality family time in the area. We offer our vacation home to limited number of guests each year. We like it to be in excellent condition for both our guests and ourselves. Limiting the amount of use the homes receives, keeps it in excellent condition. Also, we like to make sure our guests enjoy the home as much as we do during their stay. We go out of our way to make sure guests can get their questions answered promptly either by us or our fun local helpers during their stay. The house is in an open valley at 10,000 ft. surrounded by 14,000 ft peaks. Not Necessary! It can freeze at night in July. LP gas forced air with in floor heat in lower level and kitchen. (2) One dryer in the laundry room and one in the garage to speed clean-up. 3 Car plus extra stall for gear. 25 Mbps no data limit. Wireless works in most rooms also. Plus portable table for 4 more. Each bedroom has a LED or LCD TV. With smart TV for NetFlix. Several family and children's games plus puzzles. 7 foot slate table in game room. A limited number of DVDs are in the home. Basic mountain bikes are waiting for guest in the garage. Too many to list! A LOCAL PROPERTY MANAGER's cell phone number is provided to assist with any needs during your stay. We also have an Oxygen machine for guests to use if necessary. For our European guests, two bathrooms have 230V continental outlets. Hard wire internet jacks are in all rooms (the WiFi signal isn't as fast through the sound dampening fiberglass insulation in all interior walls). Finished laundry room with; two dryers, 2nd computer, sink and mirror, work bench with all basic tools, boot driers, and exercise equipment. Three stall garage with a 4th stall just to store gear, 5 bikes for guests use, 30 Amp RV Plug-in, battery charger, fluids to top off your car, & yard tools. Outside, 5 private acres with fire pit and seating for 14, & horseshoe pit. The entire home is decorated in a pleasing Southwest decor with quality, matching furniture. With all these amenities and comfort and Leadville’s charming mountain atmosphere, we invite you to enjoy Leadville’s finest. What more can we say, we've stayed at Pine View Home 10 times now. It's always clean and well maintained, love the huge yard!. Charley's local team is simply the best. For a little extra they'll even help us unload our trailer and have some supplies at the house for us when we arrive plus, catch us up on the latest happenings around town. We'll be back next year! Thanks S&S! You guys are the best. Always look forward to your return! Wooded gem close to Ski Cooper!! We couldn't ask for a better location to stay while in Leadville! It's close to Ski Cooper and close to the grocery store. The lot is fantastic for my four little boys to play in, as there is so much wide open space. Everything is super clean and comfortable! Already booked our third trip! We enjoyed our stay at Charles' place. The house is big, spacious and very clean. The location is between Leadville downtown and Ski Cooper, a perfect place for our ski trip. Outstanding. The best rental experience I’ve had. The best rental experience I’ve had. Charley was efficient and professional to work with, and a gracious host. Everything about the rental property was as advertised and expected. A perfect basecamp above Leadville in a private woods setting, minutes away from anything we needed, from simple groceries to excellent dining experiences, and with many superb fall fishing opportunities from minutes to as far away as we wanted to go. We will definitely be hoping to come back. Thank you Charley and Sue (and Susie)! If you are exploring the Leadville area, this is a great place to stay. Large home with plenty of sleeping options. Excellent home in the heart of the Rockies! We have stayed here 6 consecutive years and the home is gorgeous and the customer service is excellent. Hot springs are just a 40 minute drive south. The VRBO rate quote system does not work for this home. We use the honor system and base rates on the number of guests, giving you lower prices! Ask about clean guest and early booking discounts! Here's what to expect: Nightly: $155/nt, 2 guests, 7 night min. $430/nt, 10 guests, 4 night min. $600/nt, 14 guests, 4 night min. Weekly: $1090/wk, 2 guests, off season. $1325/wk, 1 family of 4 $1825/wk, 6 guests $2315/wk, 2 families of 4 $2925/wk, 11-12 guests $3795/wk, 15-16 guests $750 refundable reservation/security deposit due with reservation. 50% of stay cost due 60 days before arrival, remaining 50% due 10 days before arrival.